Each week we will put the spotlight on a particular industry or growth challenge to highlight what changes need to be made to improve profitability, breakthrough growth barriers and be ready 2-4 years before the exit date to be attractive to buyers… or have someone else run your business for you. Leave your questions and comments below and we will respond. He is sitting across from me. We are in a cafe. It’s noisy and yet his intensity seems to block out the coffee grinder, the newspaper pages crackling and the din of conversation for me. We are talking about his business. Interesting company. Most of his competitors are limited to selling time and projects. Not his firm. He’s got predictable cash flow and a steady stream of customers. Well, he used to have. Until 2009 when the recession caught up to his industry. He thought he had the right mix of products and services. Innovation the market was impressed with. Within his industry, his company was known for delivering great value. He had a unique product. The company grew substantially. But as he reflects on the recession he now has the privilege of hindsight: they opened new offices and hired more employees, and well… maybe they grew in too many directions without a solid plan. He looked back at me to see if I would react. Yes, lack of focus on a narrow target market and growing without addressing capacity and cash flow are all popular strategies that limit a business to grow past a certain point and for many to bounce off the ceiling and contract. By this time in the conversation he’s learned some facts that have made his situation that much more urgent. When he first contacted us, he knew he wanted to grow and he always believed his business would take care of him and his family long into his retirement. His experience in the recession made him realize that getting the right starting point plan this time for a real breakthrough was the first step. He wonders out loud if his plan should start with how to grow his business. I shake my head. That’s skipping steps. Instead, we back up along the sequence of events that have to roll out in the correct order. The right problem to solve is always the root issue, not the presenting symptom. Easy to say, hard to uncover. The presenting symptom could be seen as a the lack of growth, or the effects from the bounce: the contraction of cash, then people, then assets. But neither focus reveals a solution that would resolve the foundational issue. The real problem doesn’t have much to do with growth or contraction… this is a rabbit trail best avoided. Don’t think symptoms, think about what you really want. This owner finds that hard. He wants to prevent what happened before. But that’s thinking in terms of what he doesn’t want. 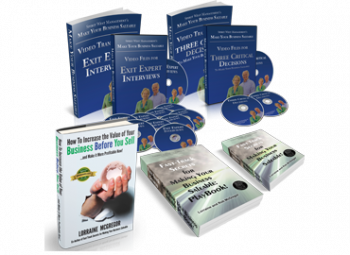 You want to grow your business to the next level. 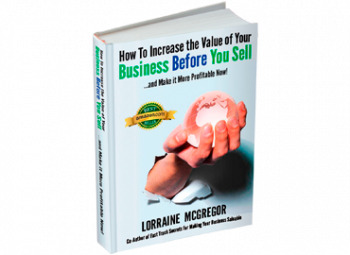 Did you know that only 4% of companies that start life ever make it to more than a $1 million in sales. Count yourself lucky you made it past that hurdle. But of the crowd that does get to $1 million, only 4% will reach $10 million in sales. Meaning that they don’t build the right foundation for growth and they hit a tipping point or an uncontrollable variable like the economy sliding and there are too many bricks missing to support the business. Down it comes. Growth can be a slippery curve up and down. You see, we are all experts at tactics and strategies that avoid history repeating itself. And since that’s where we focus, that’s where the attention goes… and not on creating that which has yet to be brought to life. So that takes us to how this owner arrived at today, having to re-build and avoid the mistakes of the past. Now let’s move forward 10 years from now to get at the root of the real problem his plan must address… his desired end result. So, what’s important to you in turning things around? “It’s a matter of pride. I don’t want to be known as the guy that failed.” A big sigh leaves him. Don’t start a turnaround if you don’t know what will motivate you: Fixing the problem to redeem yourself is not a powerful enough motivator! A turnaround is a big change project… you want change, but what will make it worth the effort? 1. At age 65 what do you still want to be running this business? 2. Do you want to sell it? 4. Have someone else run it while you collect dividends into the foreseeable future? His eyes light up on door number 4. Ah. So are you really saying by selecting option 4, that you are not sure if you have the retirement savings to live on? This is a lynchpin issue, meaning that everything hinges on balancing personal financial goals with what the company can and cannot achieve and what he can or can’t do as it’s leader. Let’s look at the facts in today’s economy. Did you know that for roughly every $1 million in savings you can pay yourself $40,000 per year? Option 4 does give you freedom and an income in case you don’t have a few million stashed away… but the company has to be able to afford it. Well then, the kind of foundation you need to build so that your company is able to grow to the point that it can afford management, and can attract a star performer able to drive profitability so it can run without you may become quite different than the business you have today. 5. Who is responsible for running the company today? 6. Who is responsible for innovating your product so that it keeps meeting and anticipating the needs of your changing market place. 7. Who is responsible for operations so that what you promise customers is what is delivered and is seen as valuable and worth it by customers? That is not a narrow enough target market that you can build a growth plan around. If we have to re-organize your business so it grows, you are going to have to make a lot of changes in how it runs and who you market to for your dream of option #4 to materialize. 9. How’s your energy these days? Yes, I see that this is important to you. But do you have the passion to drive your creativity so you will feel inspired and motivated to deliver real value to your prospects in the same way you had when you started? 10. Do you WANT to make this happen? Will making these changes and serving your customers make your heart sing? It will be a few years until you can leave the business to your groomed, mentored and trusted second in command. There is a way to find that creative and motivational spark again. If you want that energy back. 11. Then we need a plan that encompasses and harmonizes your personal financial goals, your creative strengths, your family needs, your energy level, the right target market for your product, what the business needs to adequately service that market and the type of management required to build in that level of leadership capacity that frees your time. 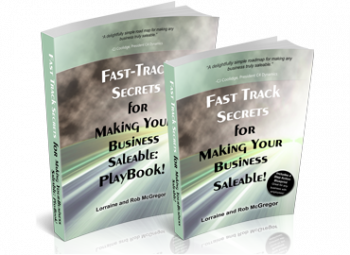 That unique plan, fit for you is what will take your business to the next level. If we don’t accommodate any one of these requirements, the foundational bricks will be missing and the slide will be more painful the second time around. 12. So that’s where we start. By the way, do you have partners in the business? “Ok, then we need to also explore their needs, concerns, goals and strengths too so we can harmonize a common roadmap. I imagine that if you have not been able to discuss the future of the business, what happened during the downturn and what direction you want to go in next, there may be some animosity and resentment between you. What we usually discover is that when we listen to both sides and show partners how to hear each other without making their differences deal breakers, then we are able to get to a plan both owners get excited about. It’s energizing work. Super. Then we have some common ground to begin your journey to a sustainable next level. Oh, by the way, making these kinds of changes is also what will make your business saleable so it will attract your ideal buyer when they are looking. You never know, that might be a better way to get several million into your bank account without having to wait until you are 65. You know, in case your current idea of running this business remotely well into your 60s isn’t what you thought it might be. Well said. Welcome to the beginning of your new future. If you would like to discover your own answers to these questions, let’s talk on Skype. Book a complementary call here. Making these kinds of choices can be complicated. Getting facilitation and insight into the impacts of making changes is what brings back the hope and energy… and the profitability and momentum. What symptom won’t go away in your organization no matter what strategy you throw at it? Leave your observations below. We may be able to help you see the root cause and get started with a solution that takes you to where you really want to grow.